California, Nevada churches challenge CBS over ?Survivor? Protesters in Sacramento, Calif., march in front of the local CBS affiliate. SAN FRANCISCO (UMNS) ? In four cities in California and Nevada, United Methodists turned out Sept. 10 to send a message of disapproval to CBS over its new format for the ?Survivor? television series. Aware of the CBS network?s decision to start its new ?Survivor? season with a plan to segregate contestants by race and pit them against each other, Bishop Beverly J. Shamana put a call out to churches around the conference to protest ?Survivor: Cook Island.? In San Francisco, Fresno and Sacramento, Calif., and Reno, Nev., United Methodists representing the ethnic diversity of the denomination?s California-Nevada Annual (regional) Conference gathered outside the offices of CBS affiliates KPIX-TV, KOVR, KTVN and KJEO. The Cal-Nevada Conference represents more than 24 different ethnic groups, and many responded to the call. In San Francisco, a crowd of more than 100 from Glide Memorial, Epworth, Temple, Downs Memorial and Taylor United Methodist churches, and as far away as San Jose Calvary, carried signs in Spanish, Tongan and English, with messages such as ?God did not divide us by race ? why let CBS divide us.? People from other faith groups joined them. ?It was something to see so many different ethnic groups take part in the protest,? said Irene Jones, a member from Downs Memorial United Methodist Church. ?We may have been from different ethnic groups, but we were all in agreement. We just wanted CBS to know that their show sends the wrong message.? In Sacramento, Shamana and the Rev. 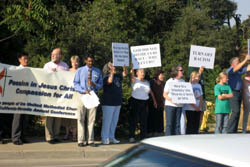 Ted Virts, Delta District superintendent, were among the approximately 100 protesters who held their vigil on the streets leading to KOVR studios in West Sacramento. Shamana, interviewed live for the evening news, called ?Survivor: Cook Island? an affront because it sought to make money from pitting ethnic groups against each other, under the guise of entertainment. ?Race-baiting for commercial ratings and profit is unacceptable,? she said. In the tiny community of Chester, Calif., in the shadows of Mount Lassen, the youth group of Chester Community United Methodist Church, unable to make the trip to neighboring Reno, decided to make their stand on the downtown streets. ?There were only eight of us, not including their pastor, but I was really proud to see them put their faith into action,? said the Rev. Norma Powell. In San Francisco, children join the protest of the CBS series "Survivor." In her letter calling churches to be aware of the program, Shamana stated, ?As God?s people of the California-Nevada Annual Conference we have declared we are one in Christ ? people of diverse cultures, diverse geography and one in Christ. It is time for us to provide visual proof that we will not tolerate television programming in our communities that places our human race on the commercial auction block, to be divided and sold for the profit of a 60-second commercial.? Bruno Cohen, KOVR general manager, met with protesters following the vigil. Talking with Shamana, he agreed to include her in an upcoming dialogue with other members of the community on issues relating to faith and culture. ?I see this as an opportunity we can use to offer a faith perspective on issues that are impacting our culture in many different ways,? Shamana said. Earlier, in a news interview responding to the vigil, Cohen said, ?CBS is absolutely confident that the producers will handle the program appropriately and sensitively, and we think it will be an interesting, provocative and worthwhile viewing experience.? When asked whether he thought CBS would stand down on the ?Survivor? episodes, Cohen said not likely. Despite losing some longtime sponsors to the show ? General Motors, Coca-Cola, Procter & Gamble, and Home Depot have all pulled their sponsorship ? CBS has sponsors ready to roll when the show premieres Sept. 14. CBS is refusing to release the list of current sponsors. Shamana has urged churches to send letters of protest to CBS New York. She said targeting the sponsors will be the next step in making CBS aware that the show?s premise is unacceptable. The conference is making letters of protest available through the Instant Connection link on its Web site, www.cnumc.org. ?Unfortunately, we must assume that CBS will continue to allow profit gain to take priority over the well-being of the community it serves,? the bishop said. But we must remain vigilant in our plans to hold the network accountable for the impact poor programming choices have on those who tune them in.? *Jones is director of communications and Myer is Connection editor for the California-Nevada Conference. Will 'Survivor' outlast its latest stunt?